A federal NIFA-CAPS grant was awarded to researchers in Florida, California, Texas and Arizona to develop a ‘Nupsyllid’. The goal of this research is to replace the wild type Asian citrus psyllid (ACP) insect vector with a population that is unable to transmit CLas. 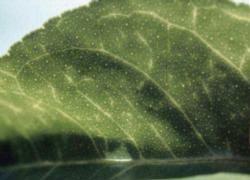 The genetic transformation could be delivered to the psyllid directly as a sprayable or an injection or indirectly via a virus or an endosymbiont that inhabits the psyllid. 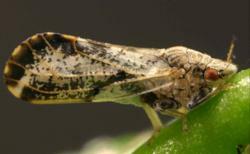 The genetic transformation lowers the ability of bacterium to survive in the psyllid or reduces the health and development of the psyllid offspring when the nupsyllid and wild ACP mate and reproduce. The goal of the Dr. Bryce Falk research laboratory (UC Davis Plant Pathology) is to find and identify viruses that can infect the Asian citrus psyllid (ACP). If one or more viruses are identified, they will be studied to see if they can be used separately or in combination to reducepsyllid populations. They will also attempt to genetically modify at least one of the viruses in hopes of using the virus as a carrier to bring ‘anti-HLB’ genes into theACP and so affect its ability to spread the bacterium that causesHLB. They have collected RNA from populations of ACP from around the world, including China, Pakistan, Taiwan, Brazil, Florida, Puerto Rico, Texas, Hawaii, Arizona and California. So far, they have found at least 5 new viruses of ACP. This work is done within the UC Davis biosafety 3P Contained Research Facility (crf.ucdavis.edu) where they maintain several populations of ACP. Similar efforts are underway for mosquitoes and diseases such as Dengue and Zika virus. Wolbachia is a widespread bacterial symbiont that naturally colonizes approximately 40% of all insect species, including the Asian citrus psyllid (ACP). 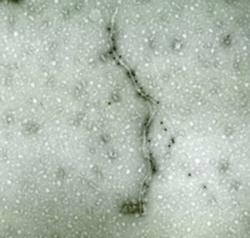 While there is only one species of Wolbachia, there are numerous different strains of the bacterium, often occurring within the same insect species. The goal of this research is to identify naturally occurring strains of Wolbachia that will disrupt CLas transmission by the ACP vector. This may occur if Wolbachia symbionts competitively exclude CLas, the pathogen that causes HLB, from colonizing ACP. Alternatively, Wolbachia may activate the ACP immune system so that it is better equipped to defend itself against Las colonization. The goal of Dr. Kirsten Pelez-Stelinski’s laboratory is to use Wolbachia as a natural “biological control” agent for eliminating Las transmission. Once a candidate strain that can reduce Las transmission is identified, large numbers of ACP infected with this strain can be reared. These non-transmitting ACP can be then released into areas where ACP populations are low. Establishment of these ACP will be aided by the unique ability of Wolbachia to insert itself into insect populations. 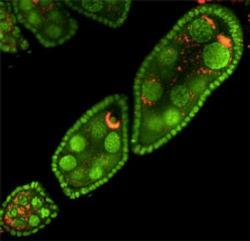 Wolbachia facilitates its own spread by ensuring that all infected females produce Wolbachia-infected offspring. Due to this unique property of Wolbachia, mass released ACP can establish in local areas and reduce Las transmission. Dr. Bruce Hay’s laboratory (Caltech University) is attempting to modify the Asian citrus psyllid so that it no longer transmits disease so that it can be released into the wild population of ACP and spread that trait (population replacement). The goal is to spread the new traits in a high frequency near the site at which they are released and be able to eliminate the new genes from the population if desired. Both of these features demonstrate to regulators and society at large that this new technology can be tested safely, and managed wisely if implemented. Other labs are studying what the various genes do and determining which trait will be used for the psyllid transformation.